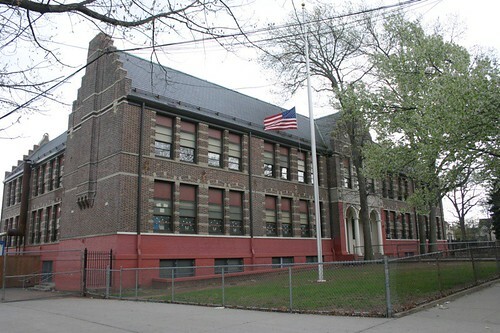 More Newark, More Schools » James Betelle, Where Are You? Last week I headed down to Newark to learn more about James Betelle’s tragically short-lived partner, Ernest F. Guilbert. I scored quickly by finding Guilbert’s obituary at the library, which painted a pretty good portrait of his life and career. With that done, I was off to chase down a number of schools I hadn’t had a chance to visit before. Most of them would be primarily Guilbert’s work, from around the time he first joined up with Betelle. 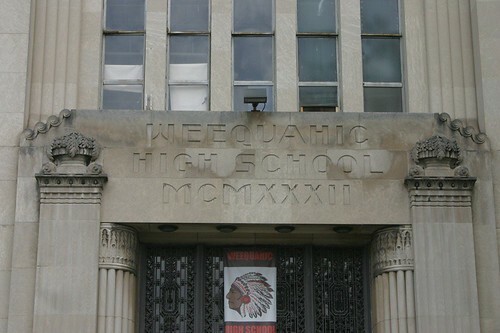 My first stop was Weequahic High School, built in 1932. It’s a monolithic Art Deco design very much along the lines of the School of Fine and Industrial Arts and the Girls Vocational School, also built about the same time. It also has the dubious distinction of being the last complete school the firm built (as far as I know). 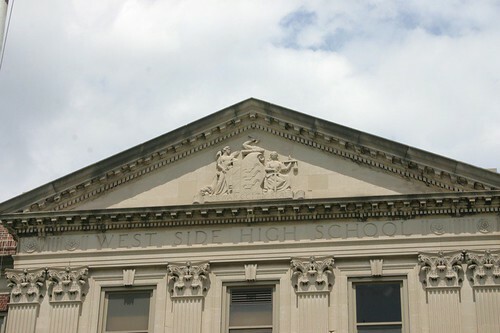 Weequahic has some pleasing surface details; fluted pilasters, Grecian/Egyptian capitals and scroll work, and stylized flowers and owl heads repeat along the roofline. Why owls? No idea. The building is overall in very good condition, with only the ubiquitous chain-link fence marring the appearance. My next stop was The Cleveland School, built in 1912. I took the below photo standing across the street in a big vacant lot next to a Home Depot. Cleveland seems out of time, with progress, decay and rebuilding swirling around it. 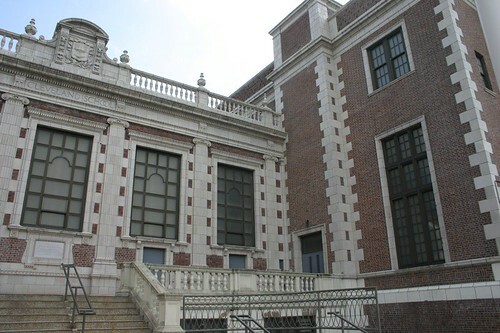 The design is very much the traditional Jacobean style that Guilbert would use in schools like the Newark Normal School; flat roof, brick with limestone quoining, and roofline balustrades and friezes. Cleveland is in pretty good shape, but sadly two impressive cupolas are gone, along with original doors and windows (a shame-check out the original window panels). 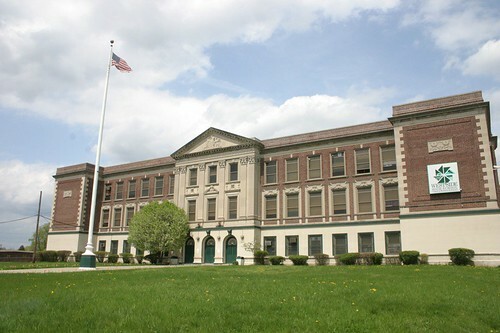 Next up was West Side High School, built in 1925. A stately Federal design, it sits on a handsome lawn and appears well-tended. 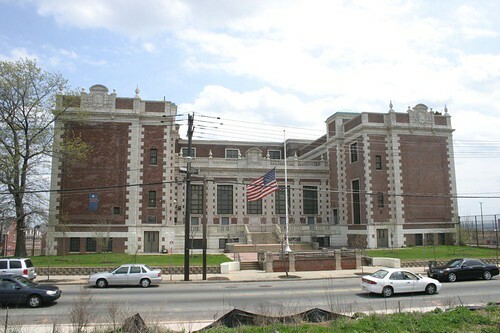 According to Newark Memories, West Side was built on the site of a mental institution (no doubt school administrators over the years have said it still is one). The central entrance is flanked by sturdy Corinthian pilasters with a relief of the Newark City Seal in the pediment. 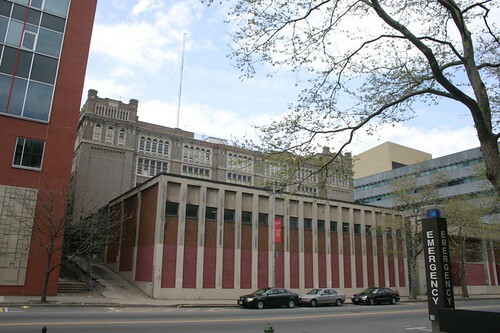 The Central Commercial and Manual Training High School, built in 1912, sits surrounded by the NJIT and Rutgers campuses. 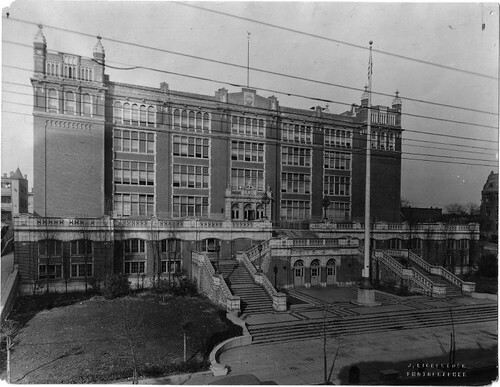 Central High, a massive five-story block-sized institution, originally featured a regal front courtyard. At some point, this incredible space was demolished, and an addition that can be best described as “evil” was plopped down in its place. I can only imagine what it must have felt like to walk along that beautiful terrace. The clever design on the sloped plot allowed for the terrace entrance to lead directly to the auditorium for public use after-hours, and the lower basement entrance for students to access their locker rooms. 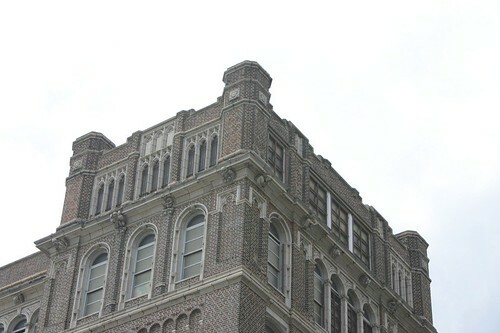 Cupolas are missing from the four corner towers, along with the central pediment. Assorted sculptural details over doors are crumbling as well. Still, much of the massive splendor of Central remains. It has the overall Jacobean proportions of Guilbert’s other work, but also has a few Gothic elements, such as the upper windows in the towers (excerpt with more on this). My final visit was the charming Ridge Street School, built about 1913. 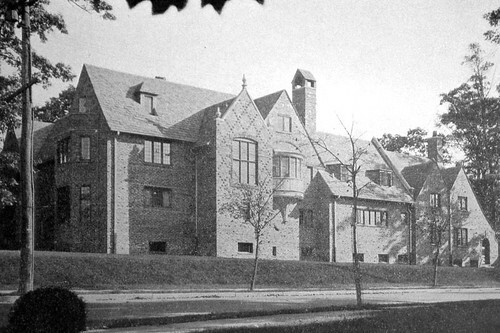 The overall plan of the school would foreshadow later Betelle grade schools such as South Mountain in South Orange and Franklin in Summit, with their gabled entrance flanked by symmetrical wings. Ridge, located in a “high-class” neighborhood, needed to be an exceptionally handsome design, and yet stay within budget. Guilbert accomplished this with a Flemish design that is unique among all the schools. 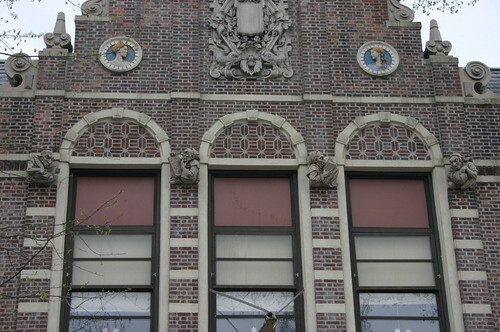 I love the “grotesques” over the entrance, which depict writing, math, reading and geography. Above them are a pair of medallions of a boy and girl flanking a fanciful relief sculpture. All of these details are in great condition. My final stop was one I was really looking forward to; The Franklin Murphy House. I wrote about the house previously, but now I was going to see it in person. The first thing I noticed was that the house, originally painted white, had been stripped to the brick. It looks great this way. Some of the original paint can still be seen in spots, mostly under eaves. I met the owner, a delightful woman who was gracious enough to let me tour the house. The interior is nothing short of spectacular; it is Tudor throughout, with heavy, solid oak doors, arched entrances and details that are all original, and in exceptional condition. 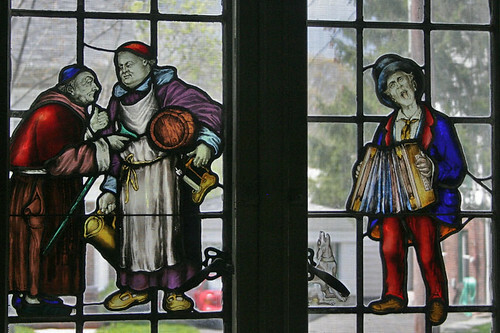 The windows are original leaded panels, with stained-glass insets depicting various scenes; ships, musicians, drunken monks, etc. With that, my exhaustive tour was done. There were a few other tidbits from this day I will probably post about in a followup. What an interesting website. It’s nice to discover someone else who knows Newark. Weequahic HS has some very impressive interior murals. Try to find a way into the lobby. 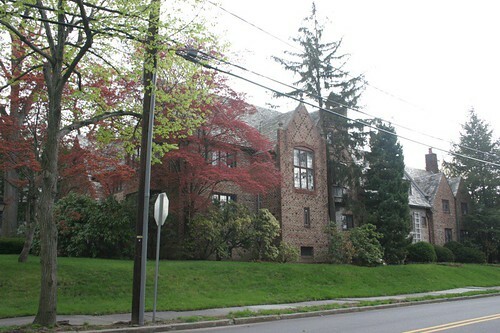 On 5/19/2007 I am leading a walking tour of Weequahic. We’re meeting at 12:15 at the intersection of Lyons and Elizabeth Aves.